Elpez2k and Big E arrived at around 8pm, it was a glorious summers evening with hardly any wind. The lads set up on the shingle beach dead centre of cod’s gulley. Baits of choice were crab, squid, sand eel and mackerel. Big E's snacks of choice were wotsits, malteasers and kit kats. Very quiet for the 1st two hours, only piece of action was the big man taking yet another tumble over a large rock and landing flat on his back. As soon as the sun went down things did improve and the bites started coming. Big E hooked into a fish around 10.30pm only for it to get snagged on the way in, after 20 mins of trying to get it free the line snapped at the shock leader knot and the 1st fish of the evening escaped. 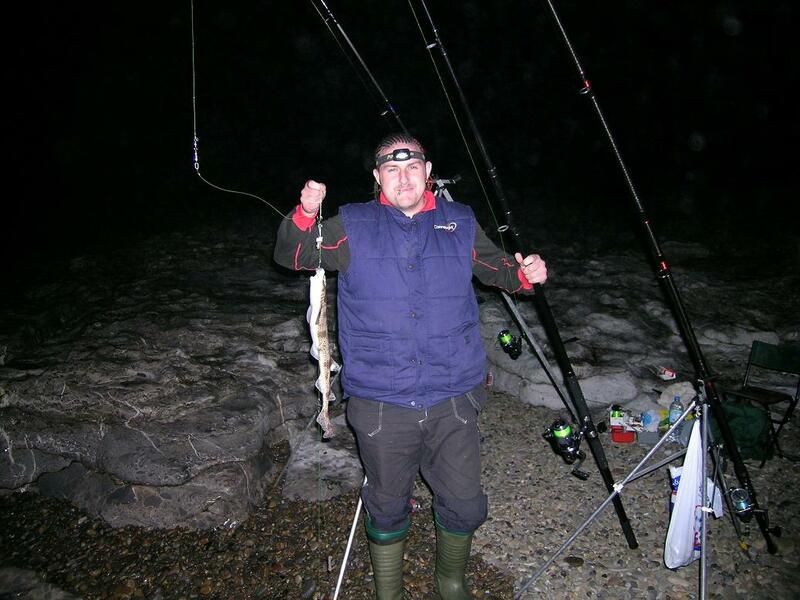 11.00pm and things started to pick up Elpez2k had a few knocks and then struck in to his 1st fish of the night. Yep you guessed it a dogfish of around 1lb. A quick photo and the fish released to pester some other unfortunate angler. Within 5 minutes Elpez2k pulled in his 2nd another dogfish slightly larger around1.5lb. 11.30pm and the lads both lost rigs due to the snaggy bottom, as they were in the process of re-tackling a shadowy figure appeared out of the gloom, The Codfather had arrived with Bessy in tow ready to do his bit for the SWFF cause. Within 10 minutes of the Codfather arriving Big E hooked into his 1st doggie of the night, a fine specimen just over a pound. The Codfather soon got in on the action too; he struck a clonker of a bite to connect with a fish only to lose it on the rocks in front of him. High tide came and went and apart from the odd bite now and again there was not much happening. At 1am Big E had a panic on, as his wotsit supply had run out so he packed up and headed for home. Elpez2k and The Codfather held out until around 2am with no luck apart from the odd bite. Not a great night in terms of fish caught, but a perfect night to be out in terms of weather and company. Let’s hope the June fishing improves. Elpez2k and Shane B headed for West Aberthaw to try their luck for smooth hounds. With reports coming in on WSF that they were starting to show and with the weather conditions being perfect for smoothie fishing the lads headed down confident of a good night. The lads set up by the "domes" and first casts were around 9.30pm. Just like the last time the SWFF took a trip here the bites were more or less instant. Within 10 minutes both our members were getting strong bites and Shane B was 1st to connect with a tidy size fish. With a large bend on his zippy and a smile on his face he wound in hoping to find a smoothie attached the other end. After winding in for around 30 yards Shane B's trace got wedged and the fish was lost! Meanwhile Elpez2k had also connected with a smaller fish only to loose that to the snaggy bottom as well. The lads retackled up and cast out again hoping for better luck. It didn’t take long for Shane B to connect with his second big fish of the evening only for exactly the same to happen again, the rocky bottom of Aberthaw was now really starting to test our brave angler’s patience to the maximum. Elpez2k had also managed to get snagged up again this time loosing everything including shockleader. Yet another retackle for both members which was eating into the fishing time dramatically. 11.00pm and Elpez2k had a massive bite within 5 minutes of casting. He wound down and struck hard, fish on! This one wasn't gonna get away Elpez2k wound in at a faster pace keeping the rod tip high in the air. A huge sense of relief as the fish made it to shore. Elpez2k ran over to where the fish lay in the gloom and picked it up it was a bass about 3/4lb not just any old bass but Elpez2k's 1st ever and the 1st for the SWFF. 11.30pm and Shane B connected with his 3rd fish of the night, eager to get this one in he wound in quickly until it got snagged yet again. No matter what he tried he couldn't get the line free and fish number 3 was lost! Elpez2k now beaming like a Cheshire cat soon hooked into another fish, he managed to get it to shore yet another bass this one much smaller around 4oz in weight. The SWFF took new member "SeaReed" to Cold knap for his 1st adventure in fishing. Members present were Elpez2k, The Codfather and Big E. They were also joined by Gavin who tagged along to "chill" in the afternoon sun. The lads arrived around 6pm to find Cold knap still bathed in sunshine. They set up at the far end of the beach and 1st casts hit the water around 6.30pm. Hopes for a good session were high a wide range of bait including mackerel, squid, rag, peeler and sandeel had been brought along. Big E's snacks of choice for this adventure included scampi fries, frazzles and minstrels. 1st hour went by quickly and quietly, SeaReed spent some time practice casting and taking a few pointers from the legendary Codfather, Elpez2k was busy putting new line on a reel and Big e was busy stuffing his face. A few small bites were showing but nothing worth striking. Just over an hour in and Big e managed to stop filling his face for a brief moment and wound in to find a small pin whiting attached to the bottom hook of his trace. RESULT he said and promptly opened a packet of Frazzles in celebration. Half hour or so later and SeaReed opened his SWFF account, he wound down and struck into a fish quickly reeling it in like a pro, the other SWFF members ran down the beach eager to see what the debutant had caught. Much to everyone’s surprise it was a nice size codling of around 3/4lb, taken on mackerel. An impressive start for the newcomer, not only a nice fish but the 1st codling we've seen come off Cold Knap this year. Up to high tide and things weren’t going great, a good bite fro both The codfather and elpez2k had gone by wasted. Then from out of the doom and gloom Elpez2k finally struck at a tidy bite to connect with his 1st fish of the session a small pouting of around 4oz was the result. Big e was starting to get alarmed with the lack of food and decided to call it a night, at least this time he managed to stay on his feet. The remaining SWFF carried on in hope of some action, newcomer SeaReed managed another fish around an hour and a half after high tide. A small pouting but by now the bites were drying up. At 11pm the lads called it a night, not a good night for The Codfather. Another blank to add to the stats, also disappointing for Elpez2k as this was his 30th trip this year and he was hoping for something special. But a good debut for SeaReed and Big E managed to keep up his 1 trip 1 fish thing going. Elpez2k and Shane B headed for the unfished venue Jackson’s Bay to try their luck on the harbour breakwater. The lads arrived around 7.30pm and after a quick chat with a few other anglers they set of to fish pastures new. Nice sunny evening with a moderate wind racing across the bay, the lads made the climb and short walk to the end of the breakwater and set up next to the lighthouse. First casts hit the water around 8.15pm, probably the deepest mark the SWFF have fished so far with around 60-70 feet in depth more or less at your feet. Within around 10 minutes Elpez2k had a nice bite on sandeel and mackerel, he wound down and struck hoping to make contact with his 1st ray but found nothing at the other end. Time for the lads to get excited, with this depth of water and such a good bite the lads felt sure it was going to be a good night. 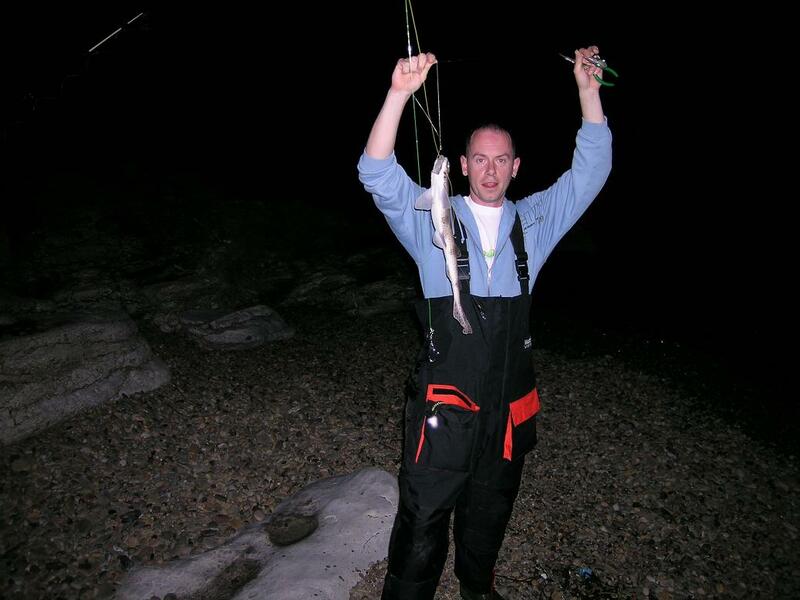 9.25pm and the first fish of the night was caught, Shane B pulling in a nice sized doggie after a good bite. Elpez2k was busy adding new shockleader after a snag up on the sea bed. Not long after and Shane B was in again, another dogfish a little smaller than the 1st. 10.00pm and with the light fading the lads were hoping things would pick up. Elpez2k was now getting frustrated at the lack of action and the amount of tackle this venue was taking. Shane B was also suffering with tackle loss caused by the tidal rip coming around the breakwater. 11.00pm and with the ever increasing rip came ever increasing tackle loss, Elpez2k now seriously despondent after losing his 4th rig, lead and leader of the night. To make things worse Shane B decided to catch his 3rd fish of the night, as he wound the fish up the rock face to his hand he gave out a shout " its a three, its a three I tell you. Another species for Shane B!" Elpez2k knew instantly he had caught his nemesis fish the rockling. The argument went back and forth for 30 minutes or so whether it should be included as a new species. Elpez2k was now distraught at Shane B's catch and the likelihood of the "sardines of shame" heading in his direction in the morning. Midnight and with hightide gone and the rip easing finally Elpez2k got in on the action, a clonking bite returned a nice size doggie around 1.5lb in weight. This was closely followed by Shane B's 3rd doggie of the night. Still in dispute over "Rockling Gate" as it is now known Elpez2k turned round to see his tip light take a massive dip towards the water. He leapt to the rod and struck, fish on "its not a doggie" he Shouted to Shane B who was now running over to assist. Shane B scrambled down the rock face to pull out Elpez2k's fish. As it came clear of the water "mutha pouting" was the shout from the bottom of the rocks. At last a big grin came to Elpez2k's face, he had caught Shane B's nemesis fish and a good one at that around 1lb in weight. Not long after and both members lost fish to the snaggy rockface in front of them. 1am and with the lads facing an early rise in the morning the lads decided to pack up. A reasonable start to a new venue. "Rockling Gate" will rage on long after this trip has ended and been logged. If by the end of the year Shane B is equal on species with another member then the species prize will be his. A new species catogory will not be started for 3 bearded rockling this far into the year as it is belived that the Codfather may have also had both species. Lets just hope Shane B doesn’t spend to much time pouting over it. Elpez2k and newbie Seareed took the 45 minute journey to Ogmore-by-sea to try their luck at "the deeps". The lads arrived around 9.30 pm and took the short walk down over the hill to the rock ledges. They arrived to find the ledges packed out with other anglers putting the lads in a bit of a predicament. After a quick look around the lads found a small sloping rock ledge about 200 metres to the right of the deeps and went about setting up for the night. The boys were fishing one rod each and 1st casts hit the water around 10.25pm. A good night for fishing with a moderate south westerly wind and the water looking nice and choppy. Within 10 minutes Seareed had a few small bites which were encouraging considering this was an unknown mark but unfortunately it came to nothing. The first hour past quickly even though there was no action and it didn’t dishearten our intrepid anglers. Variation of casting distances, position and bait provided little in the way of action. Rapidly approaching high tide and still no action things were looking grim. Then out of the blue Elpez2ks rod started going like the clappers. He struck quickly and was met by the resistance of what he thought was a dogfish, as the rig got within 30 yards of the rocks the fish decided that it didn’t want to be caught today and promptly unhooked himself and buggered off much to Elpez2ks despair. Just after high tide and Elpez2k had another very similar bite, this time he left it for a while to develop. This one wasn’t getting away and soon Elpez2k was reeling in his 1st dogfish of the night around 1.5-2lb in weight. In the meantime SeaReed was getting to see the ugly side of fishing with a nasty snag that cost him his shockleader and everything attached, shortly followed by another similar incident. Over an hour down and things were improving a few more bites for Elpez2k but no fish to show for them. Time was pushing on but SeaReed was determined not to blank on his 2nd trip and the lads fished on in high spirits anyway. 2.00am and out of the "golden hours" but this is when things started to pick up. Elpez2k had a few more knocks and before long was reeling in his 2nd doggie of the night. Then about half hour later SeaReeds rod started to rattle. With a massive sandeel/Squid combo on the end of a 3/0 hook he had little choice but to leave it develop, but it came to nothing. Elpez2k also managed to hook into another fish only for it to come off in similar circumstances to the 1st. 6 SWFF members decided to take a mid week trip to Porthcawl after reports were coming in of it fishing well. With a plan to meet at the pier the SWFF members set of in 3 different cars at different times. Elpez2k was the 1st to arrive shortly followed by The codfather and SeaReed. On scouting the area around the pier it was obvious that there was not enough room for 6 more anglers (most of which had 2 rods), as the pier, harbour wall and sea wall were packed with anglers. After a few quck phonecalls with the other members on their way it was decided to head for Ogmore deeps instead. By the time the lads had reached the deeps it was a little under 2 hours to high tide so time was of the essence. As they approached the deeps it was obvious there wasn't going to be enough room here either as there were several anglers spread out across the ledges. With time pushing on the lads headed to a small rocky area of the beach that Elpez2k and SeaReed had fished a few weeks earlier. First casts hitting the water around an hour before high tide. An hour in and not a bite for any member, only Gaz407 was busy due to heavy tackle loss from the start. Just past high tide and SeaReed and The Codfather dropped down to the exact same spot fished a few weeks earlier. Elpez2k and Shane B headed to the far right to a small rocky point to chance there luck, and Gaz407 and BTF moved back to the edge of the deeps. Around an hour down and The Codfather broke the deadlock pulling in a nice sized codling of just over 1lb. This was soon followed by the 1st dogfish of the night. Meanwhile BTF was having some luck on the deeps, he managed to hook the 1st garfish of the year taken on a lure in the very last of the light. With darkness approaching Gaz407 and BTF headed for home as the rest fished on in hope. Just after 2 hours down The Codfather landed his 2nd dogfish of the night. Shane B and Elpez2k were having no luck on the far point and decided to pack up and head home leaving SeaReed and the Codfather to fish on. As Elpez2k and Shane B reached the cars a phonecall confirmed that SeaReed had managed to land his 1st dogfish persistance paying off in the end. Despite the poor session at the Knap the previous week 4 members headed back hoping that cover of darkness would improve things. The lads arrived to find the beach looking pretty busy so they headed right in search of some space. Weather was perfect for fishing, 1st casts hit the water about 2.5 hours bafore high tide. All the way up to high tide was very poor, Elpez2k and The Codfather recorded 1 bite each but no fish landed. Tezza and SeaReed were having no luck despite a large variety of baits. An Hour down and still not tidy bites and no fish, not long after Tezza and The Codfather decided enough was enough and headed for home. Elpez2k and SeaReed fished on with reports of the odd bass around low tide keeping hopes up. Just after 2 hours down and with things looking grim SeaReed pounced on a bite and struck into a fish, on reeling in he discovered a Codling of around 5oz and a Dogfish around 1lb on the same rig. Meanwhile Elpez2k had his 1st tidy bite of the night followed quickly by another but still no fish. Things were looking up on the bite front and SeaReed soon landed his 2nd doggie of the night. After the half hours kaos things calmed back down and the lads decided to call it a night. Disasterous night for all concerned except for SeaReed, his stats now firmly up and running.